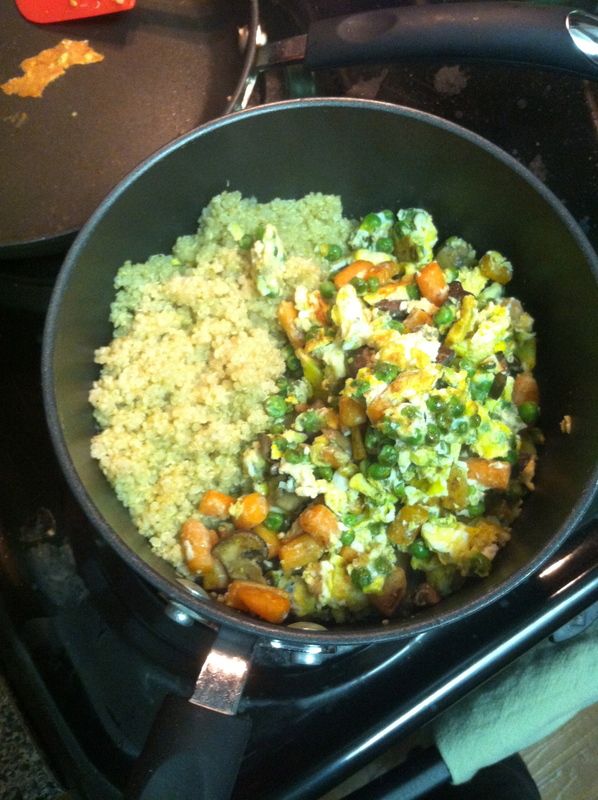 Get ready to learn how to make one of my absolute favorite meals… quinoa stir fry! The concept is fairly simple: mix cooked quinoa with any random veggies, meats, sauces you have on hand, and you’ve got a tasty meal! 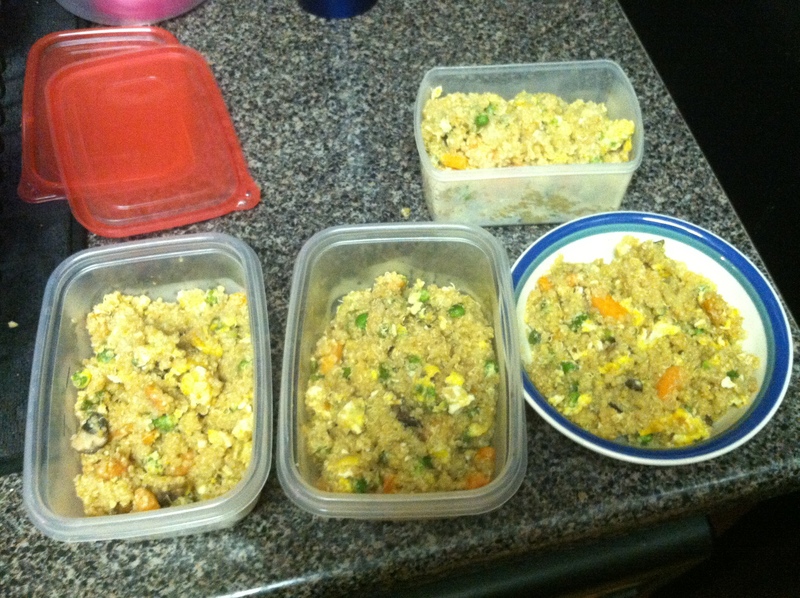 1 c various mix ins: I like green beans, carrots, scrambled egg, and peas. But seriously, almost anything works! Step 1: Add quinoa and water to pot. Bring to a boil, then turn down to low and let it simmer 15 minutes. Step 2: While quinoa is cooking, dice up your veggies. Add to a pre-heated and greased pan (I use about 1 T olive oil), on medium-high heat. Cook until desired doneness (is that a word?). 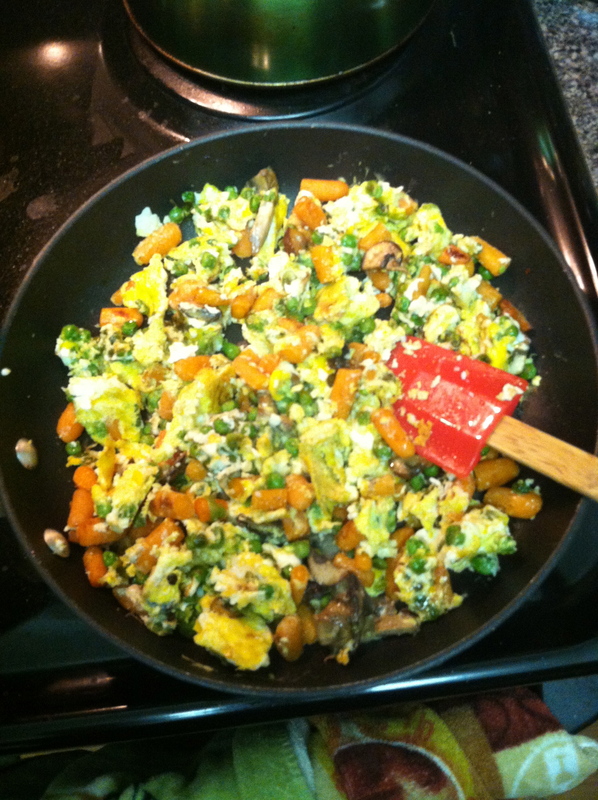 Once veggies are done, take out of pan (or leave ’em in the pan, whatever floats your boat) and add eggs. Scramble up the eggs in the pan and let them cook until done. Sprinkle everything with half the ginger powder. 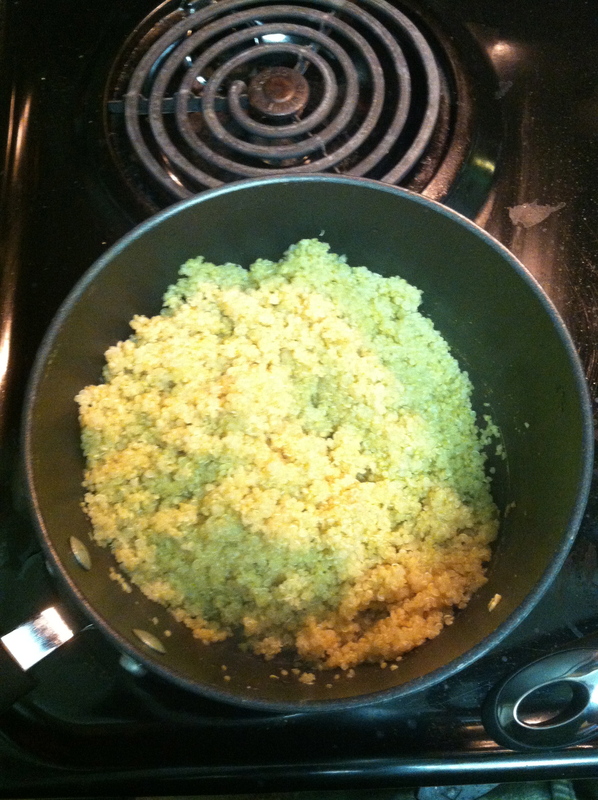 Step 3: By this time, the quinoa should be done. Fluff it with a fork, make sure all liquid was absorbed, and take off the heat. Add the other half of the ginger powder and salt and pepper to taste. Step 4: Add everything to the same pot and start mixing together. 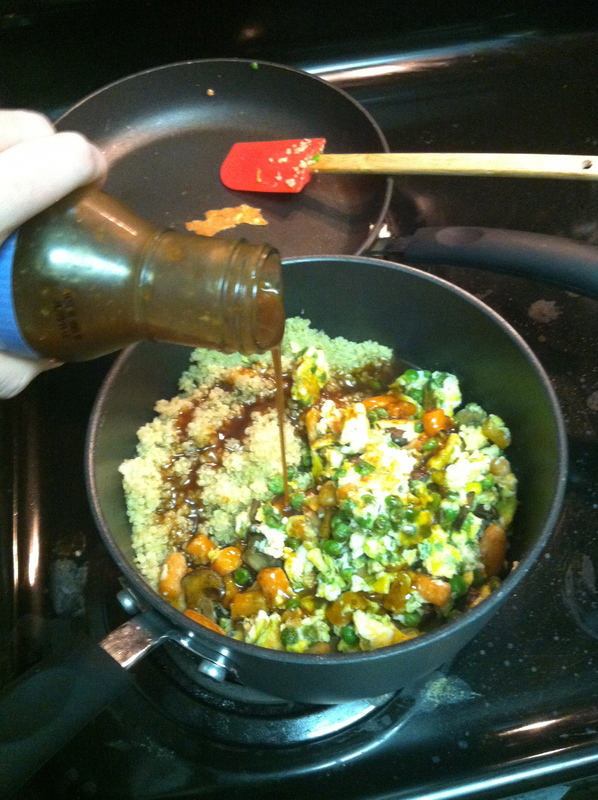 Add the soy sauce and mix until incorporated. Viola! Quinoa stir fry is ready. There are quite a few ways to travel around the country. I am here today to tell you about one of the cheapest ways I have found— Megabus! I first heard about Megabus through an advertisement on the DC Metro. It advertised travel between DC and NYC for $1. When I saw that ad, I was a sophomore in college and had friends in the NYC area, so I was all over that service. 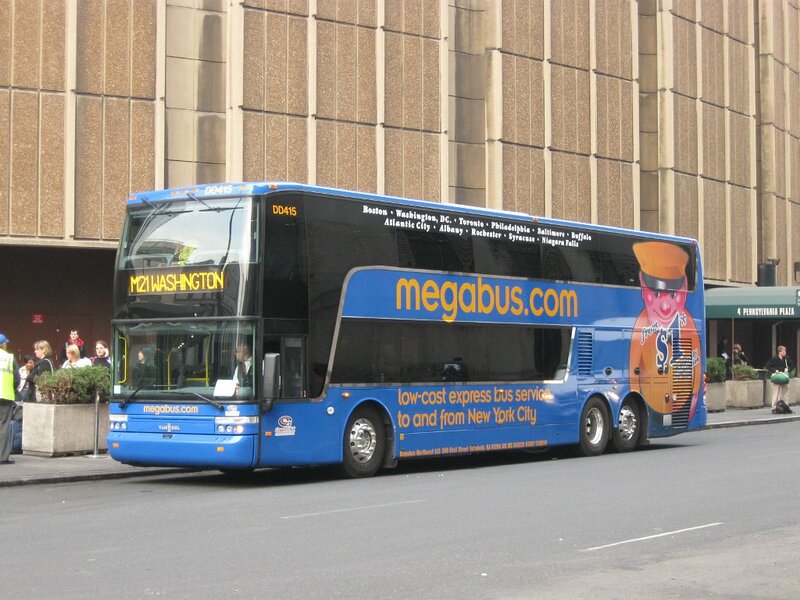 I logged on to their website soon after and discovered Megabus’ secret– not all tickets are $1. Bummer. Probably should have known it was too good to be true! A little research told me that there are a few tickets on each trip that go for $1 and the rest go for an increasing price as the bus fills up. At that point, my trip was only a few weeks away so the tickets ended up being about $15-20 each way. I probably still saved money (and headache) over driving, but it was no $1 trip! Flash forward to this year. My BF and I found out in January that his brother would be having an event in NYC in May. We immediately ruled out car as a form of travel (because seriously, do you know how expensive tolls are between DC and NYC? Add in gas, and parking… the costs get out of control quickly) and thought of Megabus. So we logged on to the website in January only to discover that the schedule for May was not posted yet. So what did we do? Monitored that website 3-4 times per week from mid-January to mid-March. That’s dedication, folks. I’ll let you in on a secret here. I can be OCD about planning. I hated the fact that we still couldn’t book our travel by March. I admit to logging on to other cheap bus lines (BoltBus and Vamoose Bus) and longingly staring at their May schedules. Why not shell out $20 each way ($80 round trip for the two of us) and have the peace of mind that comes from having our transportation paid off? But you know what? I stuck it out and it paid off. We checked in one morning and couldn’t believe our eyes when not only did the Megabus May schedule populate, but it showed each ticket as $1!! WE HAD FOUND THE ELUSIVE $1 TICKETS! I scooped those tickets up as fast as I could pull out my credit card to order. The total was $4.50* round trip for the two of us and I couldn’t be happier. Moral of the story: sometimes you’ll get lazy and want to take the easy way out. But persistence will pay off and you’ll get what you were looking for. *note: there is a $0.50 service fee on each order… yes, on each order, not each ticket.. so it is smart to purchase in bulk! Well, I’m here to tell you that is not true. I’m not a big bar-goer in the first place, but I do enjoy an occasional night of drunken debauchery. I never want to turn down a night of fun just because of the effect it will have on my wallet. Step 1: Purchase your beverage of choice and stash it at your house for times of need. Step 2: Receive invitation to partake in shenanigans with your friends. Step 3: Realize you have your favorite beverage on hand and would prefer to drink that rather than expensive bar drinks. Step 4: Ensure you will have a ride to the bar (reserve a cab, bribe a friend, figure out how to take mass transportation, etc). Step 6: Utilize ride to get to bar. Step 7: Realize you are not (or only slightly) tempted by expensive bar drinks! Enjoy your night at a much cheaper price tag. Truthfully, it can get a bit tricky to figure out the logistics of a night out that includes pre-gaming (seriously, nothing is dumber than drinking and driving- don’t do it) but it will be worth it! You may spend $15 on cab fare or bribing your sober friend to drive, but you’ll most likely save $15 at the bar. And to clarify, I don’t mean that you can’t drink anything at the bar. This method will hopefully allow you to cut your tab to 1 or 2 beers, rather than 4 or 5. Or perhaps you might even opt for soda or water instead of another alcoholic beverage! So let’s bring it back– let’s make pre-gaming a socially acceptable activity for any age group (or, you know, the ones above the legal drinking age)! You wouldn’t have dreamt of arriving to a college party without drinking first, so why do it now? Just because we have big bucks to spend on fancy drinks doesn’t mean we have to. *This post is geared towards people who want to drink alcohol while partying. If you’re not a drinker, props to you! You’re already saving oodles of money. One last note: I wrote this lighthearted-ly (that’s not a word) but you should really take it seriously. NOTHING, and I mean nothing, is dumber than putting yourself or others at risk by drinking and driving. If you have any doubts as to your ability or a friend’s ability to get home safely, spring for a cab. Those few bucks could save your life! Be safe, please. One of the easiest ways to save money is to make your own food. Buying lunch or dinner every day can really take a toll on your wallet. However, it may be daunting to sort through the millions (billions? gajillions?) of recipes on the internet and in cookbooks to find worthwhile meals. Instead, I will post a few of my favorite recipes in hopes that you’ll enjoy them too and can end your internet searching! The recipes that I feature will all be easy, fairly cheap, and healthy… and will usually make enough to have leftovers for a few more lunches or dinners! To begin… today’s recipe is Spinach and Sausage Pasta. Quite delicious, if I may say so myself :) I’ve made it twice now and both times were fantatsic! The recipe, with my changes below, made enough for dinner and lunch for my boyfriend and I.
I found the recipe on Budget Bytes. If you haven’t checked out the Budget Bytes website yet, I suggest that you do so ASAP! It’s full of these easy, cheap, and nutritious recipes that I love! I made a few changes to the recipe on that site; I used 12 oz. of pasta instead of 8 and 3 cups of chicken broth rather than 2. My BF doesn’t like cheese, so we left that as an optional add-on to our individual bowls (and I loaded up on it!). Also, I added mushrooms when adding the broth and tomatoes (because I had some on hand and needed to use them up) and completely left out the green onion. Even with the changes to the original recipe, it was quite fantastic! Side note: If a recipe calls for those extra little garnishes (green onion, chives, parsley, cilantro, etc) that you don’t have or don’t want to buy, don’t fret. It normally won’t ruin the dish! Do you know where your money goes each month? I think one of the most exciting things about graduating and becoming a “grown up” was the paycheck. I had worked some full-time stretches in undergrad, during winter or summer breaks, but I always knew those awesome paychecks would only last for a few months. When I graduated and joined the workforce, it dawned on me– I was going to get this paycheck every 2 weeks for as long as I work- what a phenomenal concept! After the initial excitement wore off, I decided I needed to start tracking where I was spending my hard-earned money. Enter Mint.com. I use Mint to track my daily transactions. It is an incredibly easy site to “set and forget”- you plug in all your account information (I’ve read a few articles about Mint’s safety, so I’m not worried about my identity being stolen) and Mint automatically tracks every transaction you make on those accounts. Super, super simple. For beginners, the best thing you can do is set up an account as soon as humanly possible. If you’re still on the fence about how closely want to track your money, that’s okay. Mint can be as involved as you want it to be. For now, if you just want to sign up and only log in once every few months, do that! It won’t take long for you to get addicted to tracking your money. After a few months of using Mint and watching your money flow in and out, I am confident that you’ll soon reach my level of Mint OCD. I log on a few times a week! Mostly, I log on frequently so that I can make sure my transactions have been categorized correctly. Once you’ve been bitten by the financial bug, one of the best things you can do to really track your spending is to come up with a list of categories that you generally spend money on. Having each transaction categorized makes it easier to compare how much you are spending month to month. When you log on to Mint, check the Transactions tab and make sure each line item has been assigned to the correct category. An example of categories making a difference in your tracking would be when you make purchases at Target. Mint always categorizes my purchases at Target as “Shopping”. But what about those times that you’re buying groceries? You’d need to change the assigned category from “Shopping” to “Grocery”. So the moral of this story? Take the plunge and start using Mint.com to monitor your transactions. Logging on a few times a month to ensure all is correct is all you need to set yourself up for monthly tracking! You’ll be able to compare spending from month to month, making it easy to see where your money is really going!